The workshop on Methods for Macromolecular Modeling (M3), held at New York University on 12–14 October 2000, provided the 187 participants from Europe, Asia, the Americas, and the Middle East1, a forum for reviewing progress in the field, discussing promising developments for the future, and voicing concerns about multidisciplinary efforts. Inspired by these issues, we review progress in several key areas, discuss challenging problems in structural biology, and address scientific and cultural issues of mathematics/biology interface research. 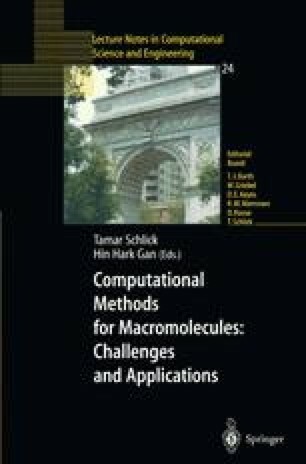 Specifically, we mention opportunities in structural genomics and more broadly structural biology (protein folding, protein folding disorders and disease, and energetic/conformational pathways in proteins); we also highlight emerging mathematical methods, unified molecular force fields, biomolecular dynamics simulations, and free energy computations. Finally, we discuss three obstacles to interdisciplinary research: quantitative problem formulations, formulation of benchmarks, and understanding the biological significance of research topics. “Science is above all a world of ideas in motion.”— François Jacob, Of flies, mice, and men .